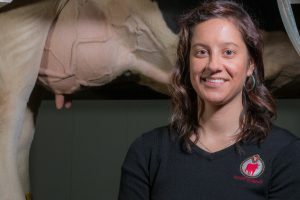 Story by: Kaine Korzekwa | By earning a National Science Foundation fellowship that was awarded to barely 10 percent of the 17,000 applicants, Department of Dairy Science and Endocrine and Reproductive Physiology Ph.D. student Samantha Weaver has definitely shown she’s not just another part of the herd. 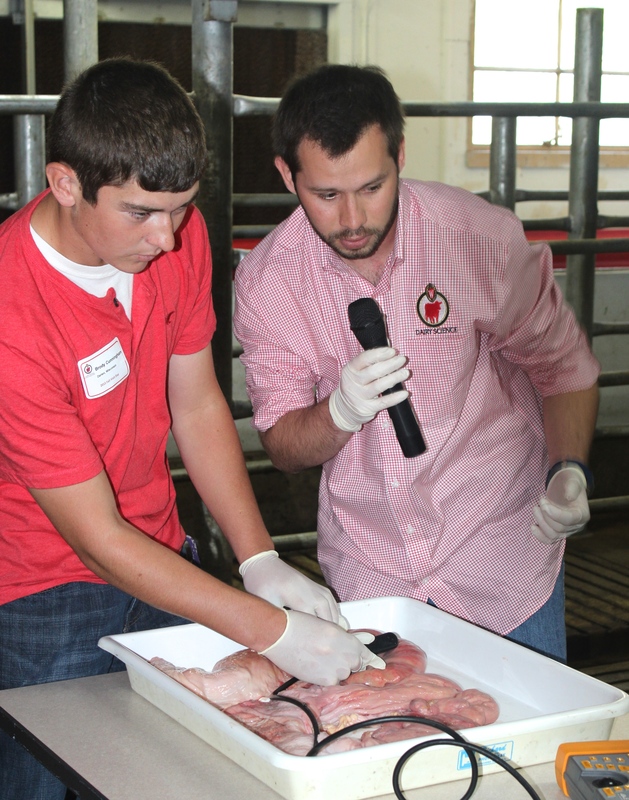 Weaver received the graduate fellowship to pursue research on the mammary gland in dairy cows. Specifically, she looks at how cows pull calcium from their bones to put into the milk they produce. She’s investigating the complex chemical mechanisms that allow this process to happen inside a cow’s body. She explains that for a long time it was thought that parathyroid hormone causes the extraction of calcium from a cow’s bones during lactation. However, she’s found evidence that this is regulated by the role of serotonin in stimulating production of parathyroid hormone-related protein, which is similar to parathyroid hormone but acts differently. This phenomenon may be what truly makes this process possible. While the difference is subtle, Weaver says knowing the molecules that make up this pathway is the key to alleviating the many problems caused my hypocalcemia, which occurs when cows pull so much calcium out of their bones for their milk that there isn’t enough left for other important bodily functions, such as muscle contraction. The result can be loss of productivity and poor overall cow comfort. Her research also has implications on another species that has mammary glands and utilizes many of the same pathways for lactation — humans. While there are some differences, dairy cows are much more similar to humans than mice, the animal most commonly studied in the lab, so Weaver hopes her research can lead to insights about women’s health as well. Weaver’s path to getting involved in research on dairy cows is anything but ordinary. A Spanish major in her undergrad at UW-Madison, Weaver was taking science classes with plans to possibly attend medical school. Her sophomore year she got involved in the lab of assistant professor Laura Hernandez in the Department of Dairy Science. From there she was hooked and started a Ph.D. in the lab right after graduation. While her focus is on a molecular approach to dairy science, Weaver enjoys how diverse her department is, studying all aspects of dairy to further the industry. 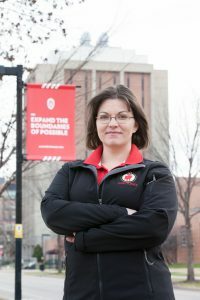 Since starting her Ph.D. she’s become involved in Badger Dairy Club and helped out at the World Dairy Expo. She was also awarded the Hoard’s Dairyman graduate student award last year. Students from the University of Wisconsin-Madison Department of Dairy Science won top honors at the National North American Intercollegiate Dairy Challenge Contest, which was held April 7-9 in Syracuse, N.Y.
Four-person teams from 32 universities competed at the event. The team from UW-Madison included Elizabeth Endres, of Waunakee, Wis., Cody Getschel, of Osceola, Wis., Megan Opperman, of Rockford, Ill., and Olivia Peter, of Lake Mills, Wis. They were coached by Ted Halbach, faculty associate in dairy management, and David Combs, professor of dairy nutrition and management. 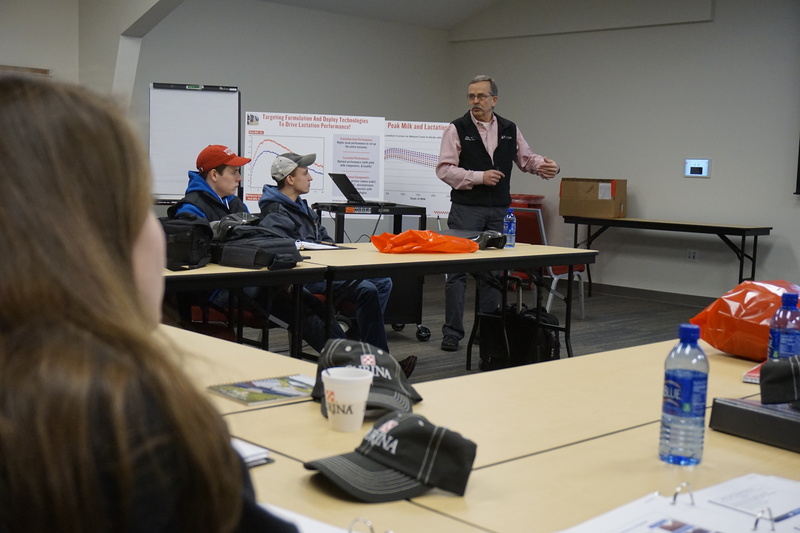 Dairy Challenge is an applied dairy management competition that involves students analyzing a commercial farm and presenting their observations and management recommendations to a panel of industry professionals. Judges include dairy producers, veterinarians, farm finance specialists and agribusiness personnel. The team made recommendations to a 770-cow dairy farm in New York to help lower their rate of pneumonia and scours, relieve overcrowding, and increase pregnancy rates. Seeing how different farms operate is the best part of the competition for some team members. For students like Getschel, the competition was an affirmation that he’s found a career he enjoys. Elizabeth Endres says that coursework in dairy science, such as dairy herd management and reproductive management, provided the team with knowledge about various industry benchmarks, management strategies, and potential solutions. Most of the team also competed in the Badger Dairy Challenge, as well as the Midwest Regional Dairy Challenge competition, where they also performed well. In addition to UW-Madison, first place team awards went to California Polytechnic State University, Cornell University and the University of Wisconsin-River Falls. Each member of the winning teams received $200 scholarships. Story by: Kaine Korzekwa | Two assistant professors in the Department of Dairy Science have secured a total of $1 million in grants from the USDA’s National Institute of Food and Agriculture. Their research focuses on using cutting edge laboratory techniques to find molecular solutions to ailments that negatively impact dairy cattle productivity and efficiency. Laura Hernandez is investigating ways to alleviate dangerously low levels of calcium in dairy cattle around the time they give birth. Also addressing the period around calving, Heather White explores the role of hepatic metabolism in the development of a fatty liver. Approximately 60% of cows develop ketosis, which is commonly associated with a fatty liver, when they give birth and start making milk. Accumulation of fat in the liver decreases the efficiency of the liver to make glucose, which negatively impacts milk production. White says that around the time of calving, cows may not be meeting the needs of lactation with their diet, so they begin to mobilize fat for energy. The issue arises when the liver can’t break down the incoming fat fast enough and begins to store excess fat in the liver. Genetics enters the equation because the protein White is interested in may play a role in helping the liver break down fat. A change in the corresponding gene could lead to lower levels of fat breakdown and therefore fatty liver. As the individual liver cells begin to fill with fat, they are unable to carry out their important functions and decreased performance is the outward result. Hernandez’s work also focuses on alleviating dips in cow health around the calving period but she studies calcium, a mineral essential for cows, humans, and all other mammals. Calcium is the largest mineral component of milk so after a cow gives birth she must begin to use the calcium in her body to make milk. Luckily for mammals like cows, they are able to pull calcium from stored bone reserves to put into their milk so there is enough left in their body for cellular activity and muscle contraction. However, the volume of milk that dairy cows must produce is so high that cows are unable to adapt their metabolism as quickly as other species and they can have a hard time getting their calcium levels back up right after having a calf. This can cause multiple other issues for the cows, says Hernandez. Among other conditions, they may tremble because their muscles can’t contract properly or get a uterine infection that makes it harder for them to get pregnant again due to the reduction in immune function that occurs during instances of low calcium availability. To combat this, Hernandez has traced the pathway of how serotonin mediates the cow’s ability to begin drawing upon the bone calcium stores earlier to prevent the sudden and large drop of calcium seen at calving. If she can get a cow to tap into that calcium pool sooner, problems can be avoided. She wants to see if giving the cows one of the first molecules in the process, maybe through a natural feed additive, will help their calcium levels. She adds that while 2-5% of cows will reach the severe clinical stage, the troubling number is that 40-50% will be categorized as subclinical, meaning they still lose productivity without progressing to outward symptoms. Across the country, that means almost $1 billion lost dollars per year. The state of Wisconsin loses approximately $125 million per year, and a further calculation shows a 112-cow dairy farm suffers roughly $12,000 per year to hypocalcemia alone. Department of Dairy Science chair Kent Weigel says only 10% of these grants receive funding, and that grants related to improving nutritional performance, growth, and lactation of animals are among the most competitive. I chose UW-Madison because I felt that it would be give me the opportunities I needed to prepare for vet school. My most memorable experience would be working as a student coordinator at the Dairy Cattle Center. From managing student employees and dealing with break downs, to calving cows in the middle of the night, I learned what all goes into keeping the cows on campus. Reproductive Physiology. I enjoyed learning in depth about reproduction as well as working hands on with cows and sows to learn A.I. and ultrasound techniques. I was also very interested in this course because I hope to do embryo work in the future. I will be joining the class of 2020 at The UW-Madison School of Veterinary Medicine and my career goal is to become a food animal veterinarian with the hopes of one day buying into a practice. Where are you studying abroad and what will you mainly be focusing on during your time away? I am currently studying at Wageningen University in the Netherlands where I am following courses on animal nutrition, the sustainability of animal production and genomics. 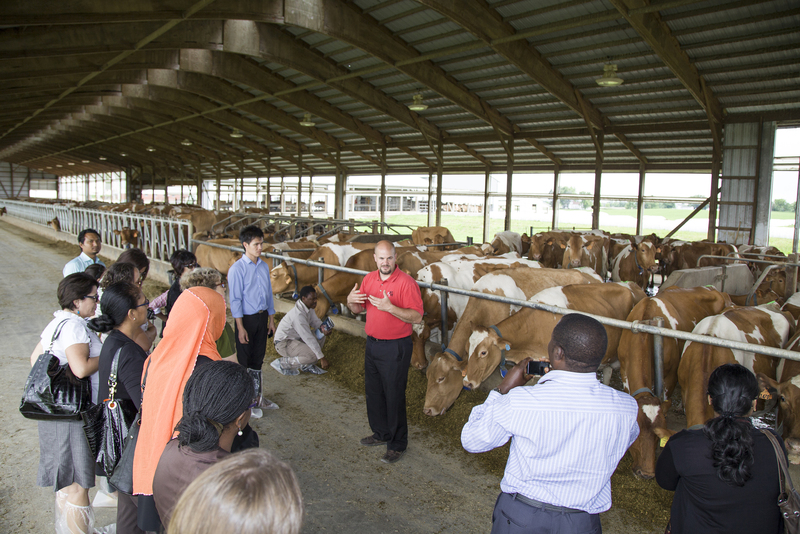 How are you utilizing your skills from Dairy Science during your time abroad? In nutrition and genomics, I use a lot of the biological science, physiology and understanding of scientific writing that I have learned. In the class on sustainability of animal systems, I use more of my knowledge on dairy management and understanding the data and statistics in research papers. What is your best memory so far of your time abroad? 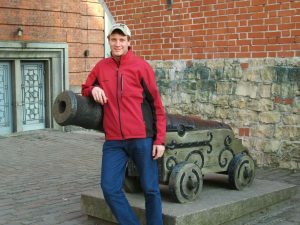 My best memory is from my trip to Riga because it was a fun filled weekend in a beautiful city. The highlight of the trip was going bobsledding. We had a Latvian Olympic bobsledder as the driver and experienced 4G’s hitting speeds over 100km/hr! The University of Wisconsin-Madison’s Department of Dairy Science invites prospective students and their parents to visit campus on Wednesday, April 20, 9:30 a.m. to 3:30 p.m., to explore what the program has to offer. What is your agriculture background? Grew up on a 376-acre farm with 130 Registered Holsteins. Even though I am fully employed with Hoard’s Dairyman, I am part owner in that operation and work there periodically. My wife’s family, Krista Knigge, also was the first dairy in the U.S. to install robots. We are close to that dairy herd too as well as the Hoard’s Dairyman Farm. What made you want to be a dairy science major at UW? To be honest, my parents. Mom and Dad both said I could not return to the farm without attending college. After meeting Dr. Dave Dickson at our county fair when I was 16 years old, the decision was made and UW-Madison was the only school to which I applied. With a 26 ACT and fourth-class ranking, I gained admittance. How has a degree in dairy science at UW been a benefit to you in the workplace? My dual major opened so many doors. Not only did I learn the inner workings of cow care, I learned a great deal about finances. This, in combination with an internship where I wrote extensively, allowed me too weave a career that involves cows, economics and communications. What clubs/activities were you involved in on campus? The combination of academics and activities provide an excellent foundation for launching a career. I joined Alpha Gamma Rho and later served as president; in Badger Dairy Club I was a two-time cheese stand chair and a vice president; served as the UW Senior Class Secretary; a senator in the Associated Students of Madison (student government); and was a member of the second place dairy cattle judging team at the 1994 World Dairy Expo. I also was a member of Alpha Zeta and the CALS Student Council. What within these clubs/activities have made a big difference in your life after college? These activities took classroom work and allowed me to gain leadership skills and hone financial and personnel management (cheese stand and AGR). 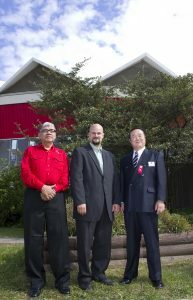 Also, each activity provided outstanding networking opportunities and exposed me to industry leaders. What was one of your favorite dairy science courses, and do you have any specific memories from it that you would like to share? I’ve never shied away from work. So when Dr. John Parrishh dropped two large binders on the desk during the first day of Animal/Dairy Science 375 and said, “We are going to learn all of this in the next three months. If this scares you, I’d suggest leaving through that door.” That may not have been the exact quote. However, it set the tone and I learned more about reproduction than I ever expected. Also, I took a capstone dairy foods processing course with Dr. Robert Bradley that involved manufacturing dairy foods and designing a processing plant. While that didn’t become my chosen career, it gave this farm boy a firmer appreciation on what’s involved with taking milk and manufacturing it into consumer products. That’s our ultimate goal. If you could give advice to your college-aged-self, what would it be? Quite simple . . . Get involved. Try more new things. Stretch yourself outside of your comfort zone. College provides a safe opportunity to practice new skills. What do you like most about your job? Variety. Covering the full spectrum of the American and global dairy industry for an English, Spanish, and Japanese publication that goes to 95 percent of the U.S. dairy industry with subscribers in 60-plus countries. During the past 20 years, I have traveled to 46 states, seven countries and been a part of two U.S. Dairy Export Council trade missions. What are your goals for the future? Grow the U.S. dairy industry through though-provoking editorial comments and industry leadership. Unique among dairy media coverage, Hoard’s Dairyman publishes 59 editorial comments each year. These pieces help shape the future and I enjoy authoring them along with my industry involvement. It is very clear that staying actively involved with UW is a priority of yours. What advice could you give alumna to step forward and maintain a relationship with their alma mater? Cultivate the next generation to grow both on-farm and off-farm talent. I often hear we don’t have enough young people to join the agricultural work force. 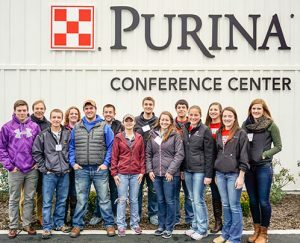 To that I ask, “When was the last time you encouraged a young person to take a campus tour?” Not everyone I reach out to attends the school, but it opens the doors to the grand variety of careers in our dairy industry and all of agriculture. You’ve also made a strong effort to continue to give back to UW. Whether it’s through volunteering at Badger Dairy Camp, holding a position on the CALS Board of Visitors, or participating in other college functions. Why is this one of your top priorities? Both Krista and I were blessed by alumni and facility who provided learning opportunities and scholarships. In the same vein, we believe providing leadership, a helping hand and money are all important. It’s one of the reasons Krista and I recently started the “Grateful Badgers” scholarship at the UW Foundation, which will support CALS students.